novaPDF needs to be activated after purchasing a license. This article describes how to activate novaPDF manually in case the automatic activation fails. 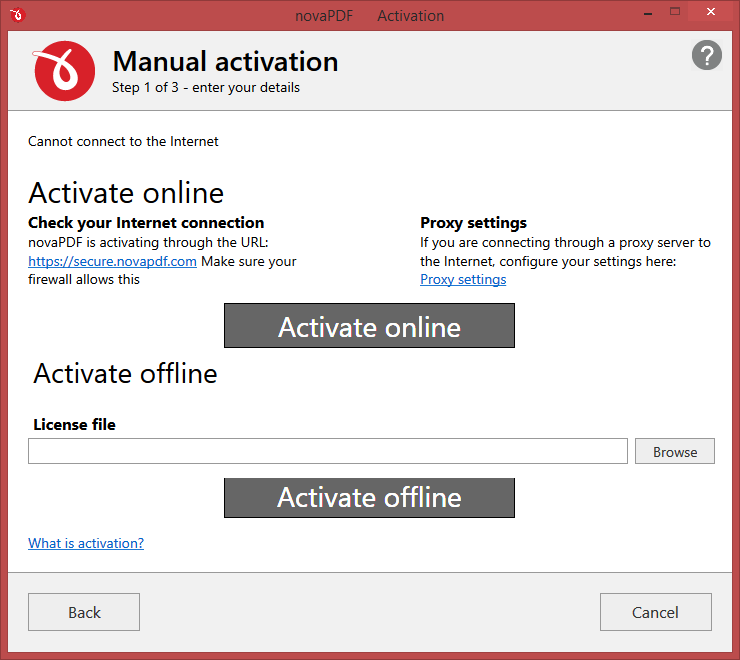 Online Activation is the recommended way to activate, however it requires a working Internet connection to activate the program. If your computer is not connected to the internet or a firewall blocks its access, you will receive a notice that the activation client cannot connect to the internet. In this case you will need to activate novaPDF manually. You can use manual activation in the rare case when the automatic activation fails due to firewall issues or internet connection. The manual activation process involves two computers: computer A, where novaPDF is installed, and computer B, the one that has internet access. 1. 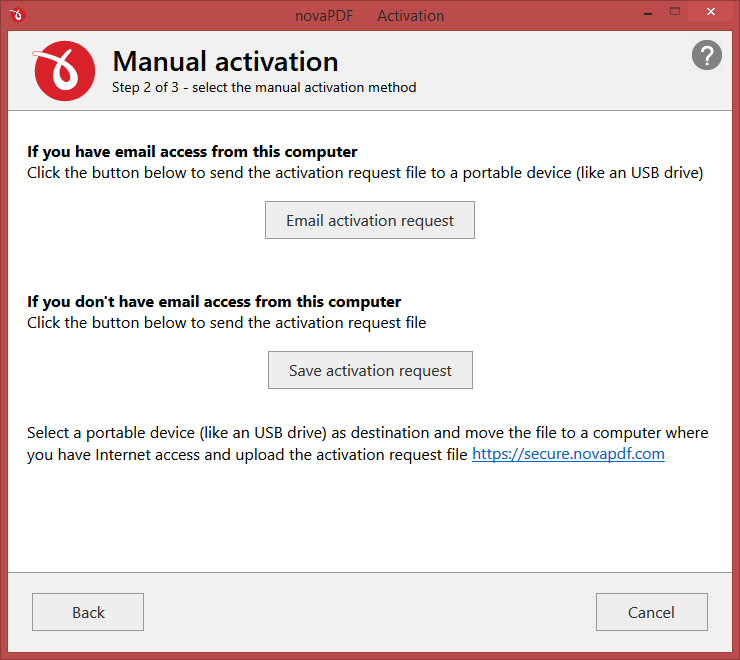 On the computer where you want novaPDF activated (computer A in the example above), click on the Continue offline button to start the manual activation process. Do this only if online activation failed due to a failed. 2. On the first Manual Activation window, click on Browse to select the license file. The license file was attached to the original email received after you purchased novaPDF - you'll need to download that license file and load it in novaPDF. Click on Activate offline after selecting the .lic file. Email activation request. Using this option, the default email client will open to send the activation request. After sending the activation request email, in a short moment you will get an email containing the activation file. Please load that file on the next page in order to activate the application. Save activation request. Using this option, you will be asked to indicate the location where the activation request file will be saved. Take that file and go to Computer B where you have internet access. Load the file on activate.novapdf.com and press Activate. 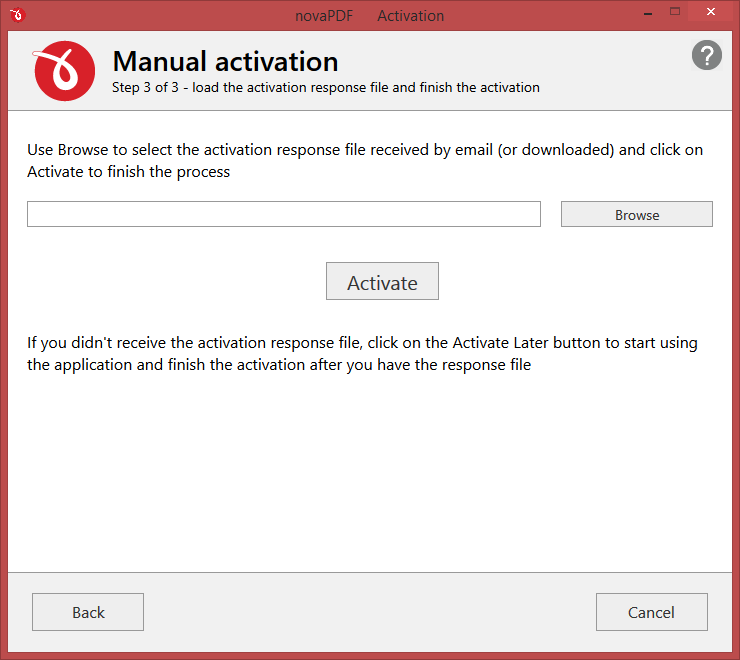 You will then have the option to download the activation response file. 4. In both cases you will get a activation response file. Press Next to go to the last step of the manual activation process and use the Browse button to load the activation response file you received - click on Activate to finalize the activation process. novaPDF activation verifies that your copy is genuine and it prevents this way software counterfeiting. The Watermarks page of the Printing Preferences window allows you to add image and text watermarks on the generated PDF pages. The images and text can also be modified in the page as the user prefers.